Jess and Norm have a secret. "We've hit the halfway mark - that's probably the best news I've ever heard, even better than winning a room," an excited Sara says. Not that her and husband Hayden have much experience at that, having finished last in all but one of the room reveals. But, after talking us through the kitchen designs - that aren't getting installed until Wednesday - it's time to hear more about the pool. Sara's called a body corporate meeting about Jess and Norm's pool. At the meeting Sara expresses her concern with a pool affecting the facade of the building and the potential for water leaks. Jess quickly sets her straight, telling her and the others that they are not permitted to do anything that affects the facade and in any case engineer Doug approves all pool plans in regard to leaks. Jess and Norm are peeved that Courtney and Hans have told the rest of The Block about the pool - after rejecting their proposal last week. "The meeting felt like it was us against the rooftop, we didn't really get any support from the other two apartments," Hayden said. Courtney says she is confused. Hayden and Sara then went on to say that other teams shouldn't be allowed to do anything good. "I think once we go into the territory on voting whether people can do the best thing that they can for their apartment that opens up the gates of 'I've heard that Sara and Hayden are getting something great should we vote on it cos God forbid they get ahead or have a crack at the competition," Jess argued. Kerrie, the little champion, opens a can of worms by saying "I think, do whatever you like"
And after some friendly stirring - mainly from the netballers, Scotty enters to give the facts - which was that there will be a body corporate meeting tomorrow, and 75 per cent vote would allow Norm and Jess a pool. Scotty lays down the laws. Hans seeks advice on the whole situation from his real estate agent, Jesse. "Hans and Courtney if you're watching, do not let them put the pool in" Jesse tells us. When vote time rolls around everyone is disappointed to hear that it's going to be anonymous. Carla and Bianca think a pool is a dud idea, so they give Jess and Norm a big thumbs up to give it a crack. Kerrie and Spence also give them the go ahead, while Sara and Hayden say 'no'. Last to place their vote are downstairs neighbours Courtney and Hans drag the chain filling out their form, but eventually decide to go with 'no'. "N-O spells no, " Sara announces. "The funny thing is we haven't told anyone we're not having a pool yet," Norm says. "So now we're just playing games with their minds downstairs." "We blew all our pool money on marble," Jess tells us. "All this commotion for a pool we can't even afford." Time for Open For Inspections. Monday night is one of the best days of the week on The Block, because it's contestant walk-throughs. But tonight it seems everyone's been given a 'play nice' directive, except for maybe Sara - or has she? "I love bagging out everyone else," Sara says as the teams start the walk arounds. It's all happy days in apartment two, with everyone liking Courtney and Hans' winning room, even Sara. Bianca wasn't sure about the Christian Cole bespoke dining table, but Sara loved it. The James Bond Bar was crowd favourite. Contestants love the wining room. Upstairs Carla and Bianca came second, and again it was all compliments from their competitors. 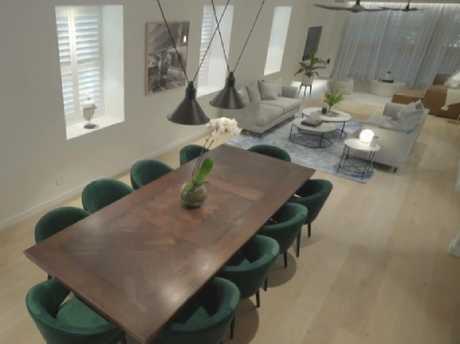 "What really gave me the s***s was it looked great," Jess said after having a laugh by mock trashing the joint after judges told her and Norm they should take a leaf out of the other penthouse's book. But the positive vibes continued in apartment four, with Kerrie and Spence in particular impressed with the room. Bianca liked the olive tree, but Sara didn't. Most agreed the fireplace would have been better positioned along the perimeter of the room, not centred. "No wonder they all said 'wow' when they came in," Kerrie said of Jess and Norm's apartment. The niceties continued when the teams visited Kerrie and Spence's room, with only Carla and Bianca thinking perhaps the ceiling was a tad low. When it came to the last-placed room, Sara and Hayden's, Jess said: "this is nicer than I expected". "I hate the fireplace it's awful," Kerrie said. 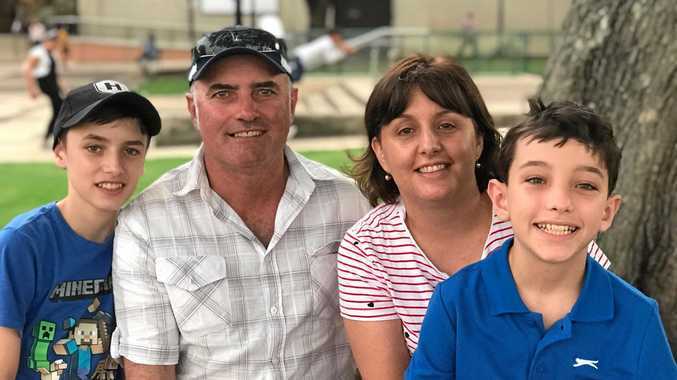 "The Shaynna-effect has worked on them," Jess said - suggesting maybe they shouldn't have let them have a one-on-one with them. 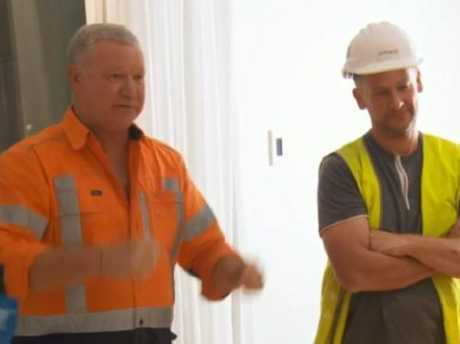 Keith creates a stir with Courtney and Hans' builder Dave calling him a cheater. Courtney and Hans have the only kitchen on The Block, where the flooring has to cross a hallway to match up with the living and dining area. To lay the sub floor we're told you first need to stagger the joist for strength before laying the sheets on top. Keith is concerned, Dave is laying the joist to far down the hallway and getting a head start on hallway week. Dave is following common build in practices, but in the rules of The Block, you can't advance beyond the current weeks room. "I don't work like this, mate," Dave fights back. "It's more about attitude," Keith says. "I don't want to play the game anymore," Dave responds. "I'm quite frazzled, " Keith says. "I don't feel good about this at all." Dave grabs his apprentice Ollie and tells Courtney and Hans the pair are leaving. 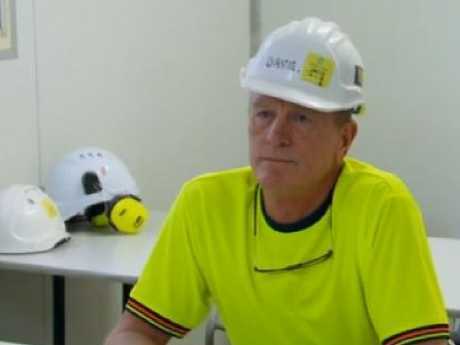 "He's the best builder in Australia, probably the world," Courtney, in tears, says. Sara thinks the situation is hysterical. Later Keith and Dave patch things up and he returns to The Block. ●EPISODE 11 - IS KEITH THE BIGGEST 'DRAMA QUEEN' ON THE BLOCK? ● EPISODE 6 - 'IS THAT CHEATING? ●EPISODE 5 - DID THE JUDGES GET IT WRONG? - The Block continues Mondays-Wednesdays at 7:30pm and Sundays at 7pm on Nine.